At this address there was a shop and a distillery of the firm “Branntweinbrennerei and Likörfabrik Alois Hermann”. The family of the owner also lived there. Alois Hermann tried to avoid forced Aryanization by assigning his property to his minor grandson Klaus Wild, son of Hermann and Martha Wild. Even after his arrest by the Gestapo on 21 September 1938 he adhered to this plan. He and his wife Wilhelmine, née Vogel, and their son Richard were forced to move to Vienna after his release from prison. In the night of the pogrom SS troupes stormed the premises and caused a lot of damage, for which they partly charged the family. Alois’ and Wilhelmine’s daughter Margarethe was married to Ing. Richard Graubart, who was brutally murdered that night. Alois and Wilhelmine went through the pogrom night in Vienna. The commissioner for Aryanization, Hermann Duxneuner, followed an order of Gauleiter Franz Hofer and installed SS-Rottenführer Alois Mössmer as a trustee of the firm. 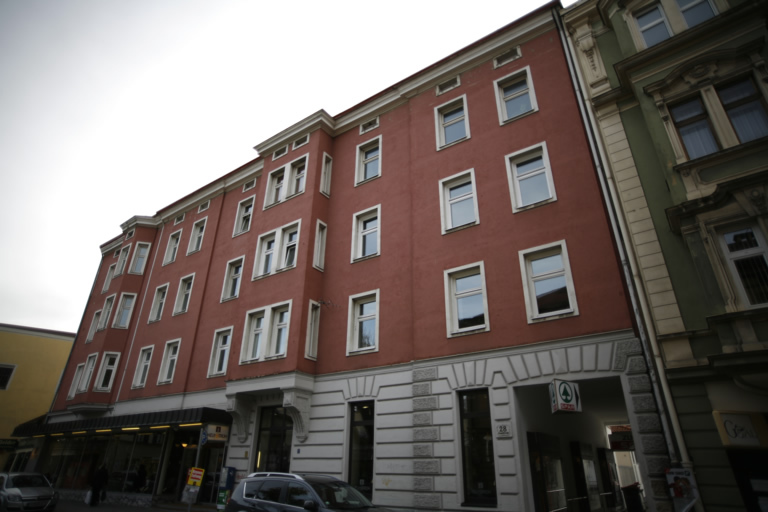 Martha Wild, the divorced wife of Richard Hermann – the divorce was realized in accordance with the Nuremberg laws – agreed to an exchange of the property in 28, Leopoldstraße with the house in 13, Amraserstraße, owned by a South-Tyrolean. Through this transaction the estimated assets shrank from 1,3 million Reichsmark to 90 000 Reichsmark, the value of the house in Amraserstraße. After the pogrom the sisters Margarethe Graubart and Elisabeth Kirchlechner fled to England and then to the USA with their children. Their parents Wilhelmine and Alois Hermann were first sent to the concentration camp in Lódz and then to the extermination camp Chelmno, where they were gassed in 1942. 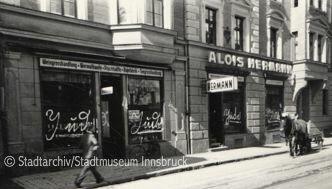 After a consent judgement in 1951 the former firm Alois Hermann, the property in 28, Leopoldstraße and a transfer fee of 100 000 Schilling were handed over to the legal heirs, among others Margarethe Graubart, who had returned to Innsbruck.